WAKEFIELD, Mass. 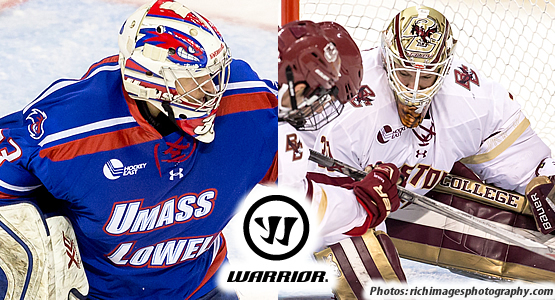 - The Hockey East Association announced tonight UMass Lowell senior goaltender Kevin Boyle (Manalapan, N.J.) and Boston College junior goaltender Thatcher Demko (San Diego, Calif.) as 2015-16 Warrior Hockey East Co-Players of the Year. 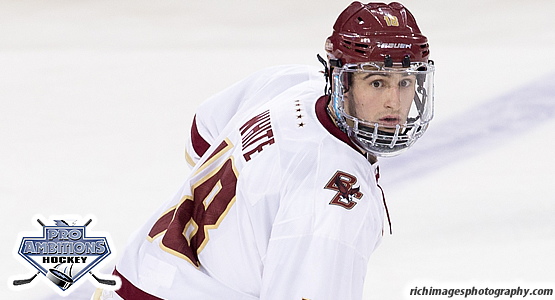 Additionally, Boston College freshman forward Colin White (Hanover, Mass.) was named Pro Ambitions Rookie of the Year and Providence Head Coach Nate Leaman (Centerville, Ohio) was selected as the winner of the 2015-16 Bob Kullen Award as Bauer Coach of the Year. All three awards are voted upon by the league's 12 head coaches. It marks just the third time players have been named co-players of the year and is the first occasion where two goaltenders share the honor. Boyle finished the 2015-16 campaign with the best goals against average (1.62) and save percentage (.941) in Hockey East, compiling a 12-6-4 record with the River Hawks. His 12 wins ranked fourth in the conference and he allowed just 35 goals in 1,341:42 of play, the fewest goals against of any netminder that played more than 60 percent of his team's minutes. For his efforts, he was named the Stop It Goaltending Champion and the winner of the Army ROTC Three Stars award, given to the player who accumulated the most points when recognized as one of the Army ROTC Three Stars of the game. He also pitched four shutouts in league play during the season, second in Hockey East only to Demko. Nationally, Boyle finished fifth in goals against average (1.84) and ninth in save percentage (.932). Demko began his junior season virtually perfectly, allowing just six goals in his first nine outings, including six shutouts, and winning 13 of his first 15 starts (13-1-1). In Hockey East contests, Demko picked up a 14-2-4 record, a league-best .800 winning percentage and five shutouts. He finished the regular season ranked fourth in goals against average (1.87), second in save percentage (.938), fourth in saves (577), and his two losses were the fewest of any goaltender who played at least 42 percent of his team's minutes. After missing two games to injury, Demko went 8-3-1 in league play down the stretch to help the Eagles to a share of the Hockey East regular season title and collected two more wins against Harvard and Boston University en route to a Beanpot championship. Nationally, Demko finished the regular season first in shutouts (9), second in save percentage (.937), and third in goals against average (1.77), and wins (23). Leaman guided Providence to a 16-3-3 league record and a share of the Hockey East regular season title for the first time in program history coming off of winning the 2015 NCAA national championship. His squad finished the season on an eight-game winning streak in league play and the Friars boasted the second-best team scoring defense in conference play with just 1.77 goals allowed per game. Offensively, Providence finished fourth in scoring offense, finding the back of the net 3.23 times per game. 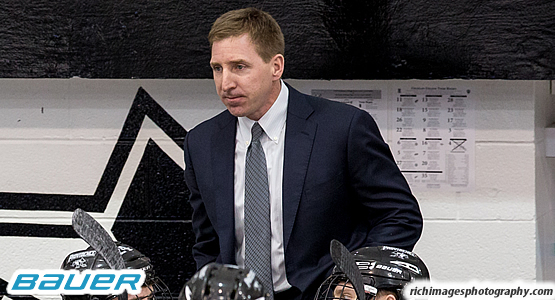 He has now guided the Friars to the Hockey East semifinals in four of his first five years at the helm. Providence, UMass Lowell, Boston College, and Northeastern are set to face off in the Hockey East semifinals Friday (March 18) at TD Garden at 5 p.m. and 8 p.m. The winners will advance to the 32nd annual Hockey East championship Saturday night (March 19). Across New England, the New England Sports Network will produce and air the Hockey East championship weekend from TD Garden once again. The first semifinal will game will be shown on NESN in its entirety beginning at 5 p.m., while the second semifinal begins at 8 p.m. on NESN and NESNplus before moving exclusively to NESNplus at 9 p.m. The title game is set to be played at 7 p.m. Saturday night and shown on NESN. Across the country, NBCSN will also show all three games in over eight hours of coverage on the weekend. Tickets for the 2016 Hockey East Championship Tournament at the TD Garden on are sale now at the TD Garden Box Office. Tickets can also be purchased on line at www.ticketmaster.com or by calling TicketMaster at (800) 745-3000.